This entry was posted in Opinions in the Shorts and tagged Amazon, Blog Musical, Cincinnati Reds, Congress, Cut the cord, Donald Trump, Lovin' Spoonful, Onion headline, Onion Satire, Peter Strzok, Politics, President Trump, Prime Day, Putin, Republicans, Stephen Colbert, Summer in the City, The Onion. Bookmark the permalink. That Stephen Colbert clip is great! I had seen and read some of the key points. FBI agent Peter Strzok would definitely be the hero in the movie and “Supercuts Vampire” Trey Gowdy the villain. My younger daughter and her husband don’t have “regular TV” at all. She catches up on shows on Hulu, and they watch Netflix and Amazon. Glad you enjoyed this Colbert clip. It seems so fitting for that spectacle masked as a hearing. Trey Gowdy had the great look for the villain. Your idea is a great potential! Thanks for sharing what your daughter does with television. So many options today! … and we also use Netflix and Amazon. The hearings are the usual assortment of bombastic gasbags feigning astonishment and incredultiy at the very behavior they exhibit on a daily basis in their own jobs.It is the Theater of the Absurd. Cutting the cord to the cable company would make a great article. Janice and I are contemplating this very ideaafte yet another negotiation session with Fioptics. A disaster of epic proportions that European trip was, for sure. Ugh. As I mentioned to an upset Brit on her blog, our president is a pathetic human being and an even worse leader. A delightful post, Frank, with two of my favorites, Colbert and the Lovin’ Spoonful – perfect song for summer 🙂 I’m gearing up to participate in Pronouns: The Musical this weekend now that I’m resuming activity on WP. This Lovin’ Spoonful song comes into my mind ever summer – especially the hot, muggy days! Glad you enjoy it & the Colbert clip – and cheers to you returning for the musical!!!! I would love a post on cutting the cord. Will take my mind off the incompetence in the government. Thanks for the encouragement, so I will put something together about cutting the cord. A graphic has come to mind, but the question is can I transform the thought into reality. Give it a shot. We are rooting for you. Would absolutely love a “how to cut the cord and survive” post. Stay cool this weekend. Cheers to more encouragement for a cutting the cord post. Who know … maybe more than one post! … but it can be done. So far so good at this end. A rainy weekend here – so it’s not too hot! Sweet on the Colbert piece, and will see you here tomorrow with my IF! Glad you enjoyed the Colbert clip … such a hoot. Looking forward to your attentions at the musical. A post on cutting the cord might be highly entertaining. And those Reds are only 4.5 games out of first place? That’s only two games back of the number of times Trump and Putin have met! Well … the All-Star break can be worst thing for a hot team … yep, the Reds came out of the gate by getting spanked 3 times by the Pirates. … and no they have numerous hitless innings against the Cardinals. Meanwhile, I will continuing thinking about how I would post about cutting the cord … but I don’t think I could make it entertaining. The Yanks are losing ground by the day to the Red Sox, who are on an epic carpet ride of a season to this point. And of course, no matter that it’s been a good season for NY to this point because NOW they don’t have starting pitching and their catcher is a bum according to the tabloids . . . I know a Red Sox fan here, who (before the season) was writing off any chance for his team. They are losing (so far) tonight to the Orioles. If that score holds up, I expect there will be an investigation into the matter. It’s a final! Red Sox lose and I believe they now have more losses than the Patriots had last season (sic). . .
LOL … Reds lose to the Cards in 11. What happened to that Reds title run??? At least Cincy fans weren’t calling for Marvin Lewis’s head. Well … I have a friend who blames the Reds woes on Marvin! Marvin is good, but he’s not THAT good! According to him, Obama’s election was also Marvin’s fault. Yeah, but . . wasn’t everything Obama’s fault to begin with? Let’s face it, since it IS Shark Week it should be noted that Sharknados happened under his watch. Bengals hiring Lewis was Obama’s fault. So was losing two Super Bowls. I figured as much . . .
And then you have the Dolphins, going on forty four years without a title. All them . . . all them. Obama is to blame for that streak. …. So is Marvin because the Dolphins didn’t hire him. See … Marvin is at fault! Imma give Marv a break . . I already done blamed him for the Russian thing . . .
“Bride and groom clearly have not kissed much” was a splat. Getting a splat is always a rewarding thing for me … and I had a feeling you would gravitate to the Pew article! Colbert did a great job with this one! I watched some parts of the hearing and thought it quite lively! Yes, you should do a post on tv options. Husband and I have been thinking of dropping cable as we don’t watch half of the programs offered. I initially thought that a cutting-the-cord post would have minimal interest here – but given the comments, it seems to be a no brainer. Thanks for the encouragement. Meanwhile, Colbert is a way I keep my sanity with the current administration. I am so very tempted to cut the cord myself. I rarely watch anything lately as it is. Mind you, it is summer and there are other things to do. Like work in this awful, dreadful, soul-sucking, mind-numbing, energy-thief of a humid heat… it’s unending and I fear that our numbers will rise on the number of deaths. We had way too many a couple of weeks ago and the heat is coming back with not quite the same vengeance but pretty close. Sorry… got off track there! And I’m behind. Again. Interesting because its hard to imagine a heat wave in your area. Thanks for the thoughts!!!! … and for your interest in cutting the cord. Damn …. and I imagine many don’t have AC because it isn’t necessary much of the time! Hope the weather returns to normal for your area … and very soon!!! Oh crap … that would be a toasty outfit! Speaking of a different variety of hot – see my post that just went live. 🙂 …. FYI … this post set up a story. We cut the cord at one time, but had trouble with the antennae and reverted back. I actually watch most of my television on my tablet, so I’m sure at some point we’ll take the plunge! Good for you. 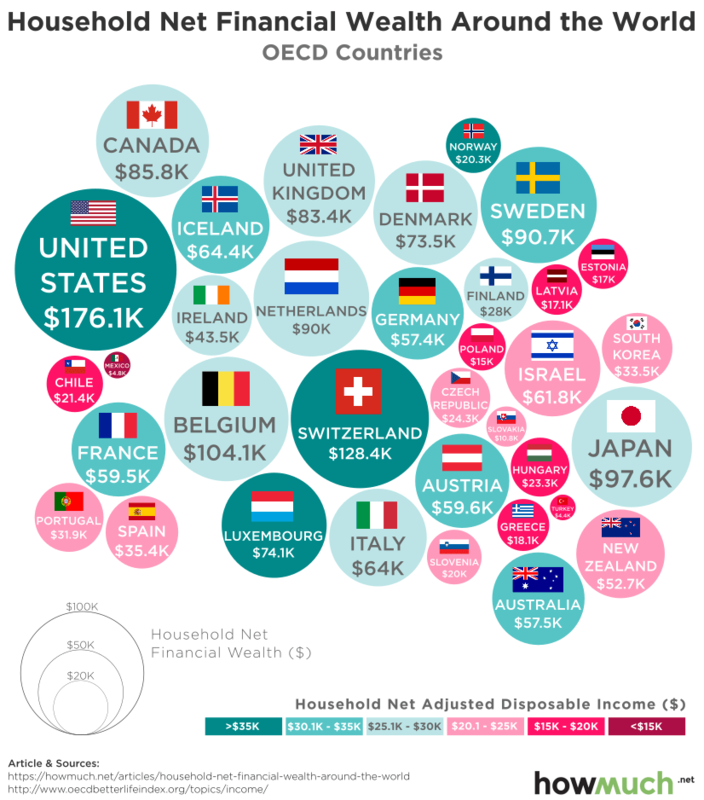 I liked the graphic on “household wealth” by nation. I was fairly sure USA would be at the top. I think we have enough to share with others and still have plenty left over (by comparison, at least). I feel I may be a minority opinion. For those of us desiring local channels, clear reception is paramount. I’ve got the feeling that some people rely too much on a small internal antenna available today. Just a thought. Hopefully my future post will come in handy for you. Meanwhile, cheers to the minority opinion.